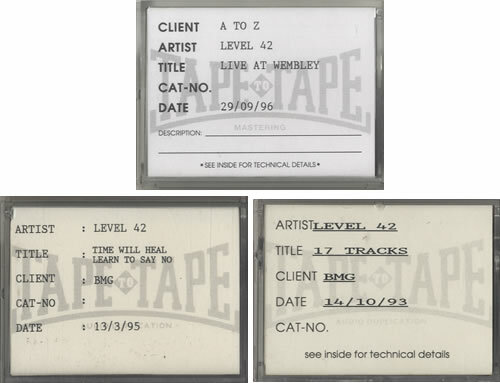 Comments: MEGA RARE DAT tape produced by Tape To Tape Mastering for BMG which shows Forever Now as a 'work-in-progress' piece with an undefined tracklisting consisting of 17-tracks, some of which didn't appear til the later 1996 reissue of the album. Also pictured is a DAT from 1995 featuring Time Will Heal and Learn To Say No - both tracks would feature on the 1996 issue of the album only. The third DAT is a copy of the 1989 Live At Wembley performance.